Horde of oily Vikings invades British Museum in protest at BP sponsorship – BP or not BP? Posted on April 27, 2014 by BP or not BP? Today, theatrical protest group the Reclaim Shakespeare Company invaded the British Museum and held a surprise performance challenging BP’s sponsorship of the popular Vikings exhibition. The performance aimed to point out the irony in the fact that an oil company accused of recklessly plundering natural resources is sponsoring an exhibition about some of history’s most famous looters and pillagers. The performance comes shortly after the same group launched a spoof Viking film based on the exhibition’s promotional trailer, and a petition calling for an end to the British Museum’s BP sponsorship deal, which is up for renewal in 2017. A large crowd of museum-goers gathered to watch the performance. Security guards looked on, but did not interfere. After the performance, several people dressed as Vikings stayed inside the museum to hand out anti-BP flyers to the public, and the cast performed again outside the museum. At 3.30pm, a flashmob choir suddenly started an a capella version of “Ride of the Valkyries” in the Museum’s Great Court, featuring lyrics about oil spills. This drew a crowd of museum-goers who then watched with interest as a gang of oil-stained “BP Vikings”, heavily branded with the oil company’s logo, marauded through the space. They then struck a sponsorship deal with the Norse god Loki to help them profit from Ragnarok, the end of the world. The gods Thor and Freyja arrived to deal with Loki and the performance concluded with applause from the audience and a crowd of people chanting “No BP! No more looting!” while symbolically ejecting the BP Vikings from the Museum. The full script can be seen below. The British Museum continues to defend its controversial sponsorship relationship with BP, despite the Deepwater Horizon drilling disaster, the company’s decision to start extracting highly polluting and destructive tar sands oil in Canada, its enormous contribution towards climate change, and its recently-announced partnership with Russian state-owned oil company Rosneft in order to exploit the hazardous and vulnerable Arctic. A new infographic released today by oil-industry watchdog Platform shows that the amount of money given by BP in its sponsorship deals with the British Museum, the Tate, the Royal Opera House and the National Portrait Gallery only makes up a very small part of their overall incomes. For example, BP provides less than 1% of the British Museum’s annual income, but receives a large amount of high-profile branding in return, as well as the use of the largely publicly-funded Museum for its corporate events. Pressure on cultural institutions to consider the ethics of their sponsorship deals is currently high. Earlier this month, the veteran human rights campaigner Archbishop Desmond Tutu said “People of conscience need to break their ties with corporations financing the injustice of climate change”. Following months of pressure, the Southbank Centre suddenly ended its long-running sponsorship deal with Shell earlier this year. Pressure is also growing on the Tate over its refusal to reveal details of its BP funding, despite being ordered to by the Information Commissioner. Campaigners from the Reclaim Shakespeare Company believe that their onstage protests contributed to the recent downgrading of BP’s sponsorship of the Royal Shakespeare Company. 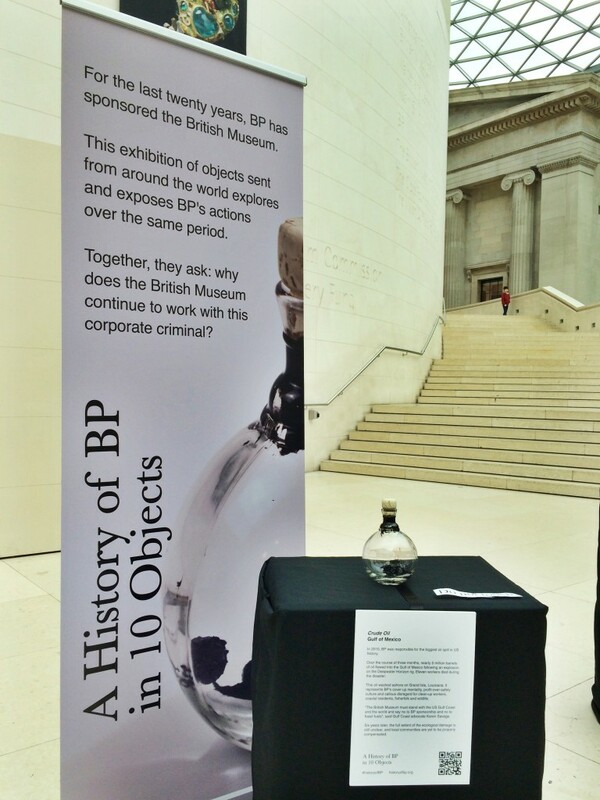 BP is the British Museum’s most longstanding corporate partner, supporting the museum since 1996, and regularly sponsoring major exhibitions. There has been a BP Lecture Theatre within the Museum since 2000. The Reclaim Shakespeare Company and Shell Out Sounds are part of an umbrella group called the Art Not Oil Coalition, alongside other anti-oil sponsorship groups such as Liberate Tate, Platform, UK Tar Sands Network, Rising Tide UK and London Rising Tide. *Spákona (a seeress):* Come hither as we tell a tale of Ragnarok, the end of the world… For ’tis coming soon. Where the oceans rise and engulf the earth, where brothers slay each other for the sake of personal gain, where the sun is devoured by thick black smoke and the world falls dead. *Spákona:* When brutish villainous Vikings such as these enter Midgard, the realm of humans, much looting and pillaging is surely afoot. Canadia, our pillaging knows no end! *Viking 2:* If it takes destruction and murder to secure our wealth, so be it. with all that’s good and pure in our nation’s great palaces of culture. * Spákona:* And so Loki deals business with these pillaging Vikings, the looting goes on… but under a veil of deceit. From land to land they go, claiming towns and villages as their own, drilling for oil, cutting up the earth and leaving a trail of destruction in their wake. From Asgard and Vanaheim, the Goddess Freyja, and the God Thor watch on as black smoke begins to cover the skies, and the seas begin to rise. They know that Ragnarok is coming. But still the humans of Midgard continue to stand still, entranced under Loki’s greenwash spell. It seems they have forgotten their pact and duty to care for Midgard. *Thor:* Loki, stop this madness! living beauty of sacred earth, sea and sky! not see Midgard perish. I am a lover of true beauty and living. the ocean’s warming waves rise to swallow the world? *Thor:* Because you tell them so, Loki – an illusion for your own ends. *Spákona:* So Loki learns that true wealth is not gained through mindless profiteering and breaks the spell, so that the plunderers of oil can hide their greed no longer, but are revealed to all as their truly snivelling selves. But these Gods alone they cannot save us, they merely shatter the illusion of the BP brand. Good people of Midgard, it is you, it is we; we must stop Ragnarok ourselves. And it is not too late. But we must act swiftly. Shall we evict these oily pillagers from our lands? Much disruption was caused to visitors, many of whom were foreign. The protest itself was silly, noisy, infantile, and largely incoherent and incomprehensible. Most of all it was deeply embarrassing. Heaven knows what impression it will have on those who came to visit one of the greatest cultural centres in the world.